PHNOM PENH: responding to the insane criticism from some people who do not understand about the global view, Samdech Techo Hun Sen, leader of Cambodian government, explained that it is not Cambodia which sends of workers to work abroad, but other countries also send the workers outside their countries so that the workers can get the high wage and obtain real skills from the work abroad; it is not like sending people to become slaves. Please listen to Samdech Techo Hun Sen. The statement of Prime Minister in the meeting with about 10,000 garment workers in Kambol area located in Por Senchey district, Phnom Penh on 18 October 2017. Samdech Techo Hun Sen said that previously, some people [The Post Columnist] used to blame him of sending the Cambodian migrant workers abroad, but he reacted that it is not only Cambodia sending laborer abroad, but the government of countries also sent the workers abroad as well, such as the Philippines which is the country sending the most workers up to 12 million and 10000 workers are working in Cambodia. Thailand taking workers from Cambodia also send its workers to South Korea, Japan, Taiwan and the Middle East as well. The countries which does not send the workers out are only Singapore and Malaysia. “Therefore, please do not criticize me of sending the workers abroad because in the past, they look down on you by saying that all of you (male-female workers) are all slave while all of you find it difficult to get the job opportunity. They blamed that I lead this country just to make the people become workers, but those speakers also work for other as well and they are not the boss, so there is no different,” Hun Sen said. 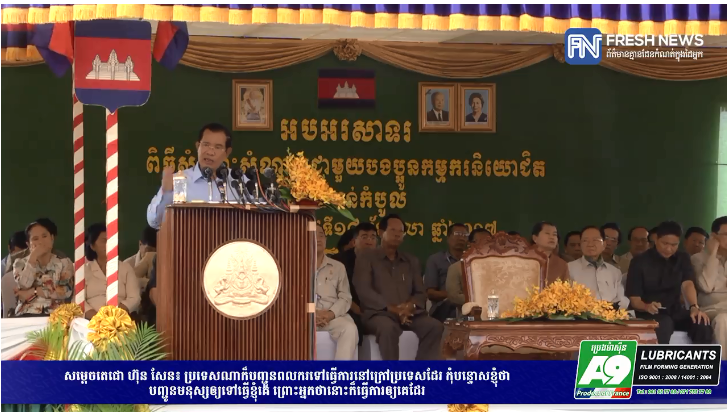 The government leader stated that it does not mean that Cambodia has no jobs, there are plenty of jobs in Cambodia, but to offer the job opportunities, government has tried to open the job opportunity abroad with high wage and that facilitates the illegal Cambodian workers to become the legal workers again. Obviously, Cambodian workers in Thailand consist of legal and illegal, but the Cambodian government which has Ministry of Labor and Vocational Training as the chief of staff is putting efforts to work with Thai government to facilitate the Cambodian workers working illegally to become the legal workers and the ministry also is trying to help Cambodian workers to get more benefits. Besides, Cambodian government is helping Cambodian workers working in South Korea, Japan and other countries with everything.